Can Chinchillas eat Sunflower Seeds? Sunflower seeds are the fruit of the sunflower and is not a seed but a cypsela as when it is dehulled the edible remainder is called the sunflower kernel or heart. They are usually classified by the pattern on their husks. If the husk is solid black then the seeds are called black oil sunflower seeds. 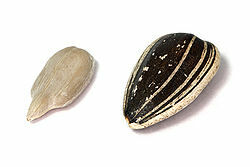 Striped sunflower seeds are mainly used for food and often called confectionery sunflower seeds. So can chinchillas eat sunflower seeds at all? Lets take a look at their nutritional data, in particular their acidic, sodium, sugar, fat, fibre, phosphorus, and calcium content is of most interest as far as chinchillas are concerned. As you can see sunflower seeds contain a lot of calcium, a huge amount of phosphorus and acidic content. This completely rules them out as far as chinchillas are concerned. If they eat too much of them they will make them ill. One or two will be okay though.